Business Labs are organized at the Department of Economics and Management of Trento (DEM). The aim of the labs is to stimulate students and scholars to apply their knowledge in the real business world. The Business Labs offer a unique path to introduce students to the generation of new ideas with the aim of turning them into successful businesses. The MIM Business Challenge (MIM BC) is a competition for business ideas open to brilliant students from different areas (management, engineering, computer science, cognitive sciences and more), who study management, have smart ideas and want to turn them into successful businesses. 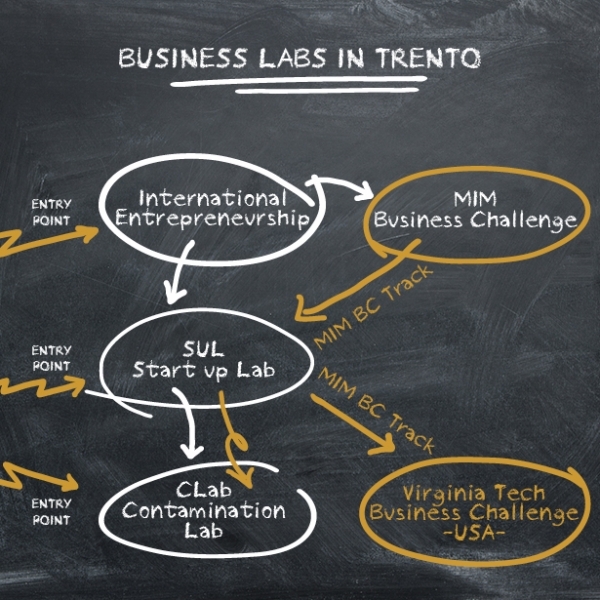 The Department of Economics and Management of Trento sponsors the Winners of the MIM Business Challenge for the participation in the final round of the Virgina Tech Business Challenge (VTBC) in Virginia, USA. The VTBC winning team will be awarded a $25,000 cash prize and the top two runners-up will receive $2,500 cash awards. Contamination Lab: a physical and digital space to allow you to interact with entrepreneurs, managers, companies, startuppers, consultants on the subject you like to have an insight on. Possibility to work on real company projects. Stimulation to become part of the core team of a real Start Up Company.